Recently released onto DVD, Barney Holiday Favorites 3-DVD Gift Set is loaded with lots of holiday fun for your children. Celebrating not only Christmas, the DVD's also address other holidays in December such as Hanukkah and Kwanza. The Holiday Favorites collection includes "Barney Christmas Star," "Frosty Friends," and Barney Night Before Christmas." While they were all great, I mostly enjoyed "Frosty Friends" because there were several different holiday shows from HIT entertainment including Bob the Builder, Kipper, Thomas and Pingu. The other two Barney shows were fun because of the pure joy of the holiday songs sung, searching for a Christmas star, as well as taking a journey to Santa's workshop. Your kids will LOVE these! These favorites are great for the whole family to sit down and enjoy. And I'm not going to lie, I could watch Christmas stuff ALMOST all year long lol! There are several fun Bonus features included in the DVD set: 2 Holiday read-alongs, 10 sing-along songs, 5 Christmas songs, 8 interactive games, Behind the scenes-info on kids in the cast, the dinosaurs, producers and educational guide. Just a little extra fun you don't get from a normal disc. The holidays are here! 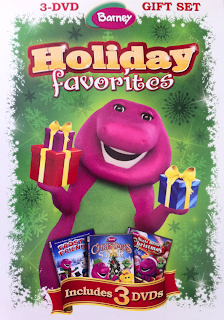 Get your copy of Barney Holiday Favorites 3-DVD Gift Set today! This was just released on October 18! Check out Lionsgate/Hit entertainment Website, Facebook, Twitter, and a YouTube page to check out the fun! Enjoy! I was provided with the above set for review purposes. No other compensation was received. All opinions are my own.